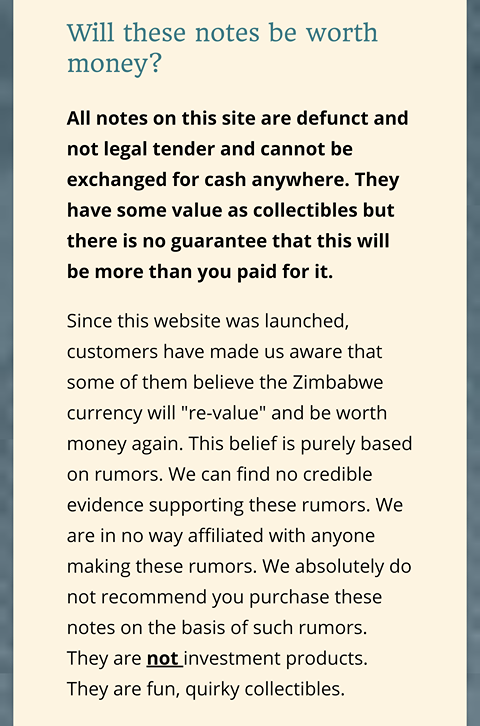 I ran across the following in my continuing research from my Zimbabwe note set. It’s from the FAQ of a website that sells the notes. This made me shake my head, that anyone would still think it’s possible that these things would ever be money / currency again - 10 years after issuance was suspended and 4 years after the official demonization of the 4th dollars. The complete failure of the 2016/2017 bond notes evidences the challenge that Zimbabwe is going to face if they ever hope to have a national currency again. The issuance of the bond notes should also provide evidence of another fact - if Zimbabwe ever does make a new currency, it will do so with the issuance of a new series of notes. It will NOT do so by making these old notes currency again. It’s just not going to happen. They can’t re-monetize that massive amount of currency that they printed and have any hopes of the new currency succeeding. If they do launch a new currency the last thing they will want is for people to be thinking about the old currency and associating the new one with that terrible episode in the country’s history. Even if, by some freak event of cataclysmically bad thinking, they did decide to remonetize these again, they’d probably remonetize the 4th dollar notes, which only run up to $500 - no one is going to become an instant trillionaire from them remonetizing all the 3rd dollars. It just will not happen. Even if they, at some later time, gain more popularity and start to become more valuable and desirable to the collecting community, they’ll only be slightly more valuable collectables. They’re collectables that I happen to enjoy a lot, so I’m going to keep collecting them and building up my set, diving ever further in the rabbit hole with subtleties, nuances and serial numbers… but let’s be real - you’re not going to get rich collecting / hoarding these things. Next entry There is now a 5th Zimbabwean dollar! The RTGS dollar!